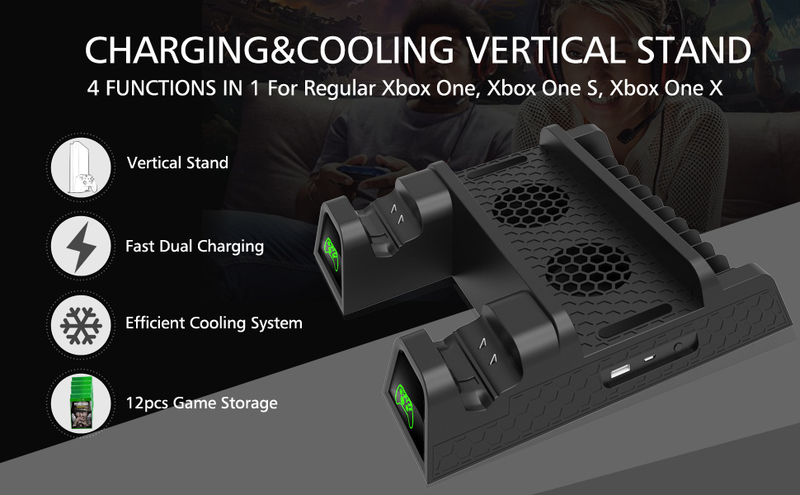 All-In-One Multifunctional Design: Vertical stand+ cooler+ controller charging station+ games storage+ USB HUB port+2Packs 600Amh batteries+ 15.3inch usb cable. LED Indicators:Lets you know when your controllers are fully chaged. 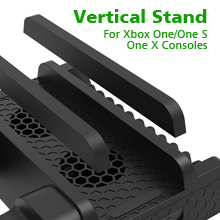 Universal Vertical Stand: Fit for Xbox One X / Xbox One X S / Regular Xbox one, allows your console to be used safely in a vertical position. 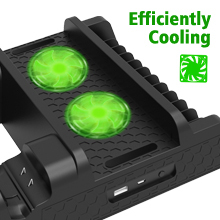 High-Efficiency Cooling System: Dual Cooling Fans keep your console cool and calm, disperse heat from console, improve the operational life span. 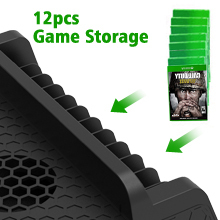 Game Storage: Features 12 slots to organizes your gaming space, store your games to keep them in order and within reach. Note: Stop using the controller when charging. When charging, the LED light shows red; When fully charged, it shows green. Very easy to plug. 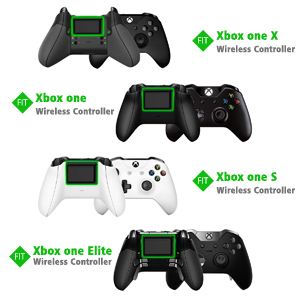 It takes about 2.5~4 hours to charge one or dual controllers; With built-in protector chip, never over charge your controllers even day and night. .
12 games slot, very easy and conveniect to storage the games you usually play in a fixed position, find the games you need very quickly. If your console is Xbox one X/ One S, you need a extra pair of sponge mats to install the corresponding adapter, and it wouldn’t be used if your console is original Xbox One. 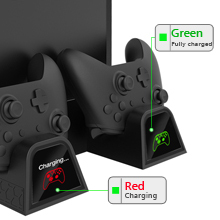 Xbox One controller charging station will fully charge your controller in 3.5hours and provide up to 7 hours of play time is achieved on the 600mah NiMH battery packs. 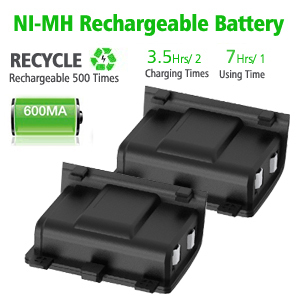 They are built to last, with a lifespan of over 500 charging cycles. Charging the batteries while the original in use, and just replace them when once they are dead. The Xbox one controller charger station can provide a perfect way to charge and store your Xbox one/ Xbox one S/ Xbox one X/ Xbox Elite controller. Ideal for saving your place to store your controllers in the charger when you do not play.